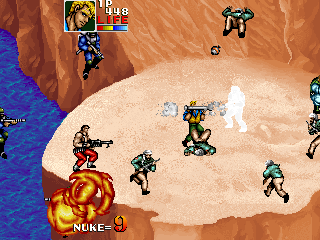 The fourth and final of Data East’s American action hero games, Desert Assault pares down many of the more unique elements in favor of good old-fashioned blasting. Your job is to move forward and blow stuff up everywhere. There are no keys to find, no cases to unlock, and no hidden items. You’re constantly switching weapons, from machine guns to shotguns to flamethrowers, and you have a limited quantity of screen-clearing bombs. 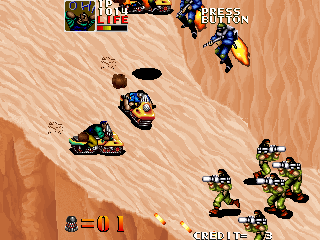 Occasionally there are some hostages to find and vehicles to ride, including sand skis, jeeps, and hover tanks. 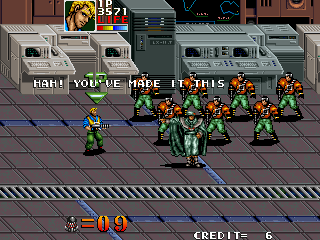 Your commandos also still have health bars a la Bloody Wolf, but otherwise it’s remarkably straightforward. Keep in mind that this is absolutely not a complaint, because it takes the core action and amps that way up. 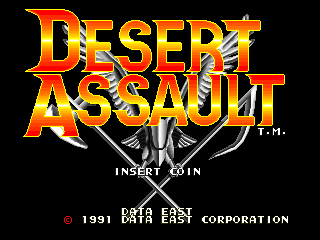 In many ways, Desert Assault outclasses Data East’s other games for two primary reasons – first off, it’s leaps and bounds in front of the other titles from a technological standpoint (despite coming only two years after Bloody Wolf), and secondly, because it capitalizes on the multiplayer trend started by Konami’s Teenage Mutant Ninja Turtles by letting up to four players cause total mayhem at once. Snake and Eagle from Bloody Wolf return, along with two new characters, Monkey and Spider. Outside of their appearance, the only difference between them is the type of bomb attack they use. Desert Assault is by far one of the best looking run and guns ever made. The explosions are satisfying, smoke gives off a nice thick haze, and the pace is breathless. The action is viewed from a slightly isometric angle, giving it a bit of extra depth, although unlike Bloody Wolf, you can’t jump. 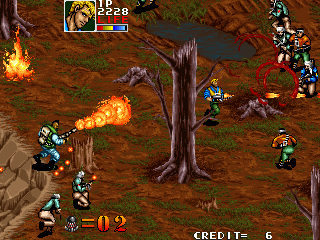 The weapons are typical – machine guns, shotguns, flamethrowers – and each of the four commandos has their own unique screen-clearing bomb. 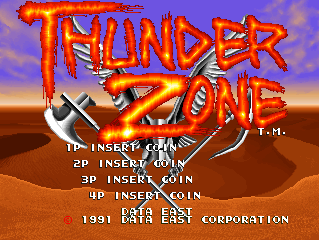 The music consists of sampled guitar riffs coupled with FM synth music, perfectly capping off the all-American, hard rock Desert Storm war fantasy. It’s got plenty of great details, too – health is restored by grabbing cans of fizzing soda, and each character has a portrait by their life bar which changes based on the situation. They’ll give a refreshed sigh when getting a health restorative, show a cocky pose when detonating a bomb, or display a tombstone when they get killed. 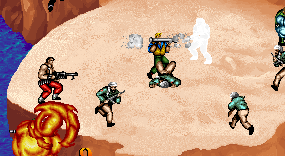 Most amusing is when you get set on fire, requiring you to rock the joystick back and forth to put it out – the portrait shows your soldier doing some kind of flaming pirouette. If you’re playing in multiplayer and one of the other players is downed, a surviving character can pick him up while the wounded one can continue to shoot. 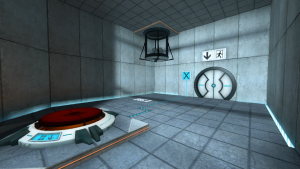 There are some great setpieces, too, like an area where you’re supposed to sneak past spotlights (though you just run in, guns blazing anyway), or blast through a series of doors while being chased by poisonous gas. The boss of the fourth level is, inexplicably, a gigantic rock, several stories tall, which is equipped with all manner of weaponry. 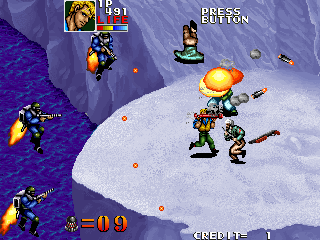 In between stages are also training levels, ranging from shooting galleries to button-mashing boot camp segments, where you compete against your fellow commandos for bonuses. The final stage sends our heroes to stop a missile launch at the last second, not by hitting any button, but by completely destroying the computer itself. Then you hurl yourself at the window onto an escaping jet plane for the final encounter. 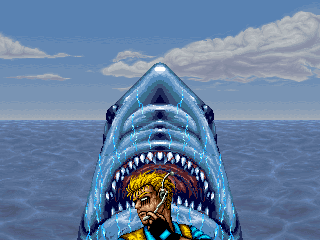 The game ends with our heroes plunged out into the ocean as they swim in panic away from a shark, whose graphic seems to have been ripped straight from the Jaws movie poster. It’s a perfectly silly way to end such a ridiculous experience. For all of its charm, Desert Assault is the least known of their run-and-guns, as it never received a home port. 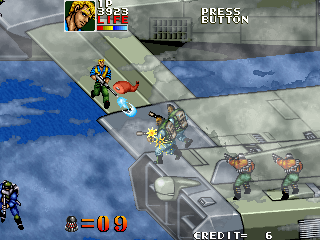 It probably would’ve felt at home on the Saturn – it’s far too much of a graphical powerhouse to run properly on a 16-bit console without major downscaling – but since the game ends after a mere five stages, the extremely short length may have made it unsuitable for console play. Regardless, it’s easily one of the most enjoyable overhead run-and-guns made, right up there with Capcom’s Mercs and Saurus’ Shock Troopers. Regionally, the Japanese version has a handful of changes. The biggest one involves the second stage – in the American and World versions, it takes place in the desert. In the Japanese version, though, it’s set in Antarctica. This was probably changed to fit in with the overseas name, Desert Assault, as well as trying to tie itself in with Operation: Desert Storm, which was going on at the time. 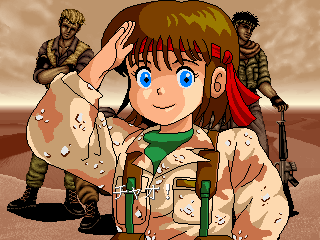 If you beat the game in a single credit, you also get an image of an extra cute little girl congratulating you. 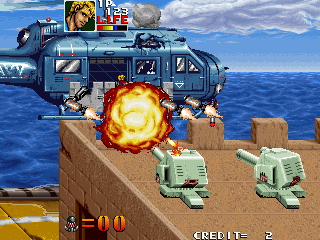 In the American version, the bombs are called “Nukes”. 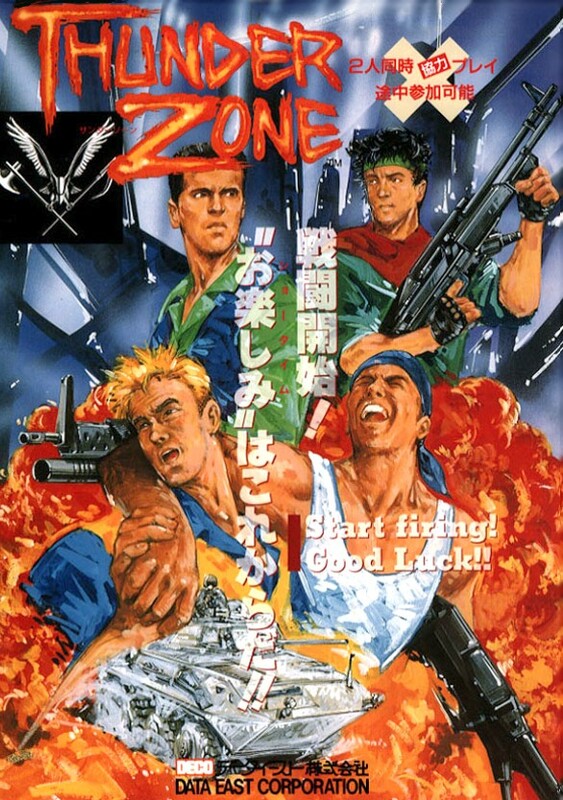 The plotlines are also slightly different – in the first stage of the English release, your goal is to rescue hostages, so there’s a small part after beating the boss where you run into a building to save someone. This is missing in the Japanese version. 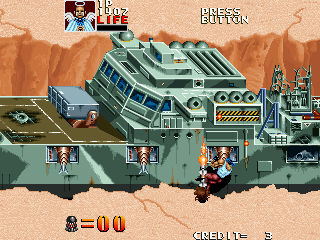 In the English version, one of the main goals is to rescue an ambassador named Stein, whereas in the Japanese game, you need to rescue a doctor named Brown.